It’s no secret among my family and friends – I LOVE popcorn. Especially flavored popcorn. The problem of course is finding popcorn that uses natural, healthier ingredients but still tastes good. Oogie’s Gourmet Popcorn makes that happen. I was delighted to be able to taste test a range of flavors from Oogie’s Gourmet Popcorn. My husband Matt (a fellow popcorn-lover) and I both loved the Movie Theatre Popcorn flavor. Usually I find that most popcorns that attempt this flavor overdue it – making it a greasy mess. But Oogie’s manages to re-create the movie theatre taste without the greasy, heavy feel. Matt was a big fan of the Spicy Chipotle & Lime – it really has a nice heat to it and if you are a fan of spicy, this flavor is for you! I’m a big fan of the Kettle Corn, satisfies my sweet tooth! Matt and I both felt that the popcorn is flavorful, and yet light. Very tasty. Oogie’s is a 100% whole grain product that combines only the finest all-natural ingredients, without any artificial flavors or colors. Popping in 100% percent corn oil means Oogie’s popcorns have no cholesterol, no trans-fat, and is entirely gluten-free. It really is a no-guilt snack – a perfect way to satisfy a popcorn craving while watching a movie at home. And the smaller snack size bags are perfect to take to work or anywhere on-the-go. You can find out more about Oogie’s Gourmet Popcorn on their website, on Facebook and Twitter. 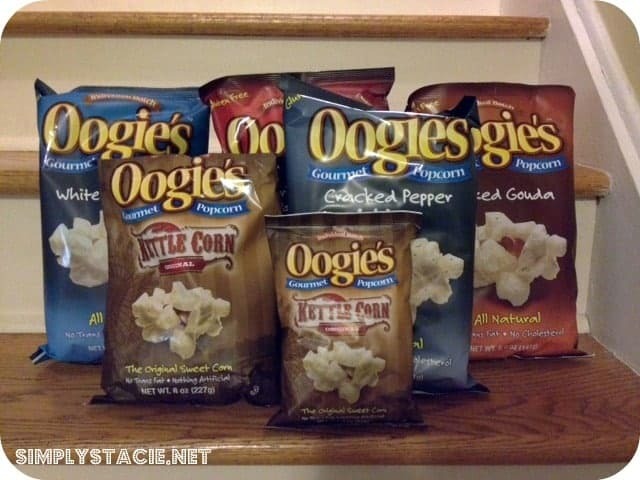 To find a store near you that sells Oogie’s, check out their store locator. You can also buy Oogie’s online. Five lucky readers will win a popcorn lover’s dream – 28 of Oogie’s snack size bags including: 7-Movie Lover’s Butter, 7-White Cheddar, 7-Kettle Corn & 7-Sundried Tomato & Parmesan. Hatch Chili Con Queso sounds good! Hatch Chili con Queso is my favorite. Romano & Pesto sounds terrific! The Sun-Dried Tomato & Parmesan flavor looks very tasty!